The 153,000-square-foot Kelley Engineering Center is a dramatic departure from most academic engineering buildings. 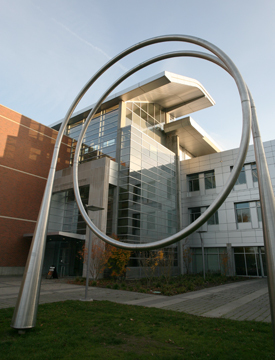 Not only is the structure designed to drive collaboration and innovation among faculty, students, and visiting business partners, a “Gold” LEED® (Leadership in Energy and Environmental Design) certification from the U.S. Green Building Council made it the the greenest academic engineering building in the U.S.
From sky bridges and hallway alcoves to glass-walled conference rooms, graduate student offices clustered around research laboratories, and an e-café in the atrium, the building's layout truly is a home for innovation, encouraging occupants to cross paths, stop, chat, and brainstorm new ideas that will translate into cutting-edge research, new companies, and economic “oomph” for Oregon and beyond. 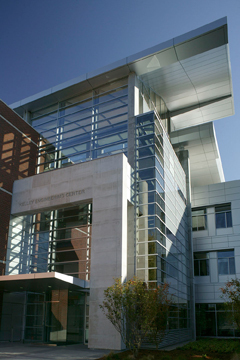 The Kelley Engineering Center is the home for the OSU School of Electrical Engineering and Computer Science, which has an impressive track record of successful collaborative research projects. The building was funded by a $20 million gift from Martin and Judy Kelley, $20 million in matching funds from the state of Oregon, and $5 million in private gifts. 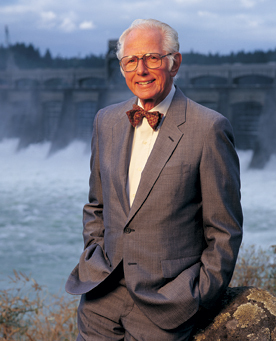 Martin Kelley was a 1950 OSU civil engineering alumnus who rose to vice president and chief engineer of Peter Kiewit Sons’, Inc., one of the nation’s largest construction firms. Kelley personally oversaw much of the construction of the building that bears his name. Building occupants can regulate the temperature of office spaces by opening or closing windows, making fresh air always an option. The building responds to an open window by turning off the heat to that room. The central atrium and windowed walls supply virtually all classrooms, labs, and offices with natural light, cutting lighting costs up to 40 percent. Paints, finishes, flooring, and wall surfaces were selected to minimize off-gassing, improving air quality and supporting non-toxic manufacturing processes. An extensive heat recovery system pulls more waste heat from the ventilation system than standard equipment and pays for itself in less than four years. A highly reflective white roof reduces rooftop heat absorption and helps keep campus cooler on hot days. Not only do the planters contain native plant species and make a great place to sit outdoors, they also act as bio-filters, removing unwanted contaminants. Rainwater falling on the roof and into planters is collected in a 16,500-gallon system and stored to provide water to flush toilets and irrigate the landscape, reducing water usage by more than 60 percent. Indoor bicycle parking and showers, covered outdoor bicycle racks, and easy access to Corvallis and University bus routes encourage the use of alternate transportation modes. Permeable sidewalks and plazas constructed of pavers mimic natural drainage and minimize storm runoff compared to conventional concrete. 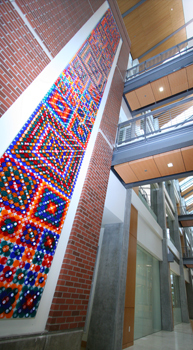 Because of energy efficiency systems employed throughout, the building uses about 60 percent of the energy consumed by a similar conventional building. A waste product replaced a portion of the cement in the concrete resulting in reduced carbon dioxide being released into the atmosphere. Solar panels on the roof produce 2400 watts that heat water for sinks and showers, and a roof-top solar collector assists with water heating. This piece uses industrial grade reflectors to visually incorporate two concepts used in computer science: fractals and trees, These two concepts are expressed in the layout of the large reflectors. The design is composed of a series of squares with the center square 16 reflectors by 16 reflectors in size, followed by an 8x8, then a 4x4, a 2x2, and finally a 1x1. Small white reflectors are layered over this pattern to resemble a computer motherboard. “Flock” is a kinetic sculpture consisting of six triangular sails made of dozens of light-weight aluminum plates, suspended in pairs, The sculpture captures the air flowing in the soaring atrium, and moves in ways that are organic, whimsical, and unpredictable. This large-scale outdoor sculpture is a sonic converter of the explosive Sun, turbulent reality of the Sun into a gentle and intimate “hum.” The piece is 19'5" in diameter and constructed almost entirely of stainless steel. 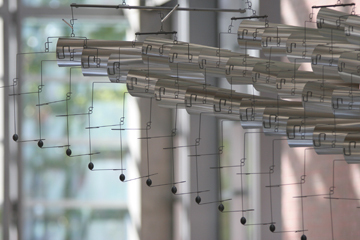 Through finite element analysis, the artwork is tuned to vibrate at the 8th octave note of the Sun’s tonal frequency -0.807 Hz. To amplify the ringing of the Sun, a recessed bell is built into one of the sculpture's footings.